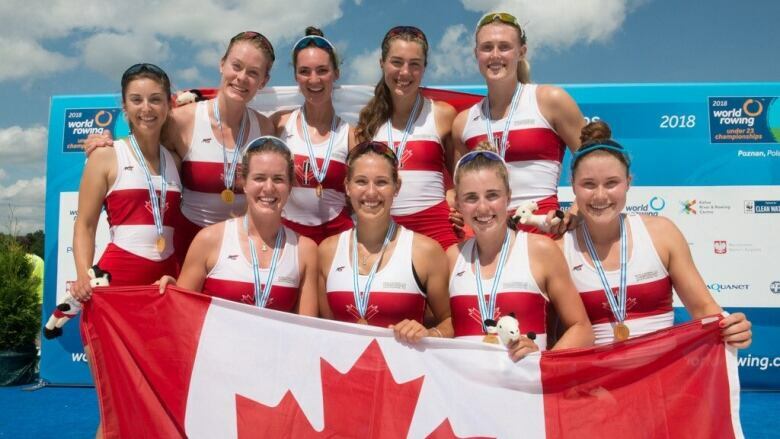 Canada won two gold medals at the U23 rowing world championship Sunday, taking the women's eight and men's single sculls in Poznan, Poland. The Canadian women's eight boat powered by Isabel Ruby-Hill, Avalon Wasteneys, Sydney Payne, Stephanie Grauer, Kendra Wells, Madison Mailey, Morgan Rosts, Ivy Elling-Quaintance, and coxswain Laura Court waited patiently to race in their A Final event after qualifying directly from their heat on Thursday. Canada overtook the United States in the third 500-metre leg and finished with a time of six minutes 4.61 seconds to successfully defend their 2017 world championship title. "The race was fantastic," said Payne, a two-time U23 gold medallist. "We stayed calm and collected and kept our focus internal. We stayed with our race plan and everything went as well as it could have. To repeat as champions means more than words can describe." Canada's Trevor Jones, the reigning world champion in the men's single, secured the win with a comfortable 33 stroke rate and time of 6:48.70, two seconds outside of the U23 world record.